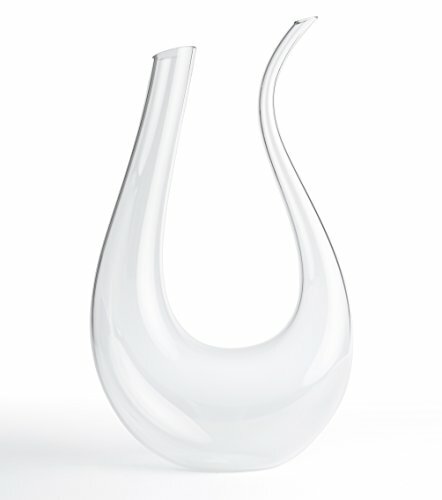 Sleek modern design - This striking “swan” wine decanter by HiCoup allows you to serve guests in a contemporary way. Beautifully crafted, each one of these artisan-made, mouth-blown, lead-free crystal glass decanters is a unique piece of art for your bar or dining room table – bringing sophisticated style to any gathering. Maximum aeration and drip-free pouring – Shaped like a swan or horn, our decanter is well balanced, easy to grasp, and simple to use. Pour your 750 ml wine bottle into the decanter through the large opening. Allow the wine to decant for the desired time – fully aerating it, and separating any sediment. Then impress your guests with the perfect drip-free stream that pours from the neck of the decanter. Great for all occasions - Most younger red wines benefit from aeration, and older wines may have sediment that needs to settle. Even some white wines can be improved with decanting. But this gorgeous glass decanter also doubles as a carafe for any drink – so you can serve orange juice from it to add a touch of class to Sunday brunch, or leave it filled with water on a guest’s nightstand. The lead-free crystal gives the decanter clarity and brilliance. With a sparkling glass sculpture this beautiful, you’ll want to use it frequently. The perfect gift - Whether you’re shopping for a unique hosting present, or a special gift for Christmas, a birthday, or Father’s Day, the HiCoup decanter is perfect! Your wine-loving recipient will know that oxygenation can be essential to experiencing the full flavours and aromas in red wine. Others will appreciate the timeless beauty of this stunning crystal decanter, no matter what they serve in it. So order now and wrap it up! A high-quality product backed by HiCoup's outstanding customer service - We'll let our seller feedback speak for itself. We’re so confident in the quality and durability of our products that we stand behind them 100% with a FREE LIFETIME WARRANTY. If something breaks, or if you don't absolutely love your new Glass Wine Decanter, we’ll offer a REPLACEMENT and/or REFUND YOUR MONEY – no questions asked.